Eating a varied, balanced diet and keeping active helps your body get exactly what it needs to get the best out of each and every day. This helps you stay fit and well. 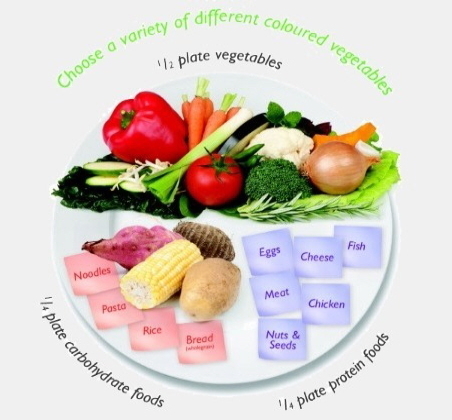 Eat plenty of different coloured vegetables and fruit. Choose small servings of wholegrain breads and cereals, brown rice, wholegrain pasta, kumara, and potato. Have some low-fat milk (green, or yellow top), cheese and yoghurt. Include at least one serving of lean meat, seafood, chicken, egg, tofu, dried peas, beans or lentils. Eat three regular meals and follow the healthy plate model (shown in the picture) for lunch and dinner. Prepare foods or choose prepared foods with minimal added fat, sugar and salt. Limit treat foods and keep portion sizes small. Drink plenty of fluid, preferably water. Aim for at least 30 minutes of moderate activity. Be active in as many ways as possible. Move more and sit less! Where can I find out more about eating well and being active? Information on healthy eating from a Māori perspective. Download this booklet which has easy-to-follow advice on how to choose healthy foods and drinks, have a healthy bodyweight, and be active every day. This includes resources such as shopping tips, free healthy cookbooks, and recipes for healthier versions of favourite dishes. How to start being more active. Other pages in the section provide tips on how to move more in your everyday life, how to keep motivated, and support programmes that can keep you on track. Current Opinion in Clinical Nutrition & Metabolic Care, Sleep and obesity, retrieved May 2017.
International Journal of Obesity, Impact of sleep, screen time, depression and stress on weight change in the intensive weight loss phase of the LIFE study, retrieved May 2017. JAMA, Comparison of weight loss among named diet programs in overweight and obese adults: a meta-analysis, retrieved May 2017. J Med Internet Res, Mobile phone apps to promote weight loss and increase physical activity: a systematic review and meta-analysis, retrieved May 2017. Ministry of Health, Clinical guidelines for weight management in New Zealand adults, retrieved May 2017. Ministry of Health, Eating and activity guidelines for New Zealand adults, retrieved May 2017. Ministry of Health, Food and nutrition guidelines for healthy adults: a background paper, retrieved May 2017. PLOS.org, Low carbohydrate versus isoenergetic balanced diets for reducing weight and cardiovascular risk: a systematic review and meta-analysis, retrieved May 2017.